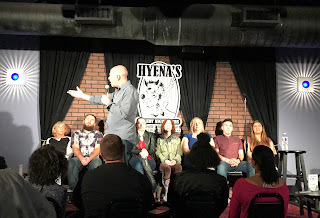 Sunday night, we went with some friends to a local comedy club that was having a comedian/hypnotist. Before the show, while we were all at dinner, we had a discussion about hypnosis- was it real, was it just a hoax, just… what?! My friend, Kathy, said that she had once been to hypnosis for weight loss and that it worked for her. She wasn’t necessarily saying she was hypnotized, but from how I interpreted what she said, her hypnotherapist gave her guiding meditations to help her subconsciously make good decisions throughout the week in regards to food. And it worked. It was sort of the way I see positive affirmations. Which from time to time, I try to practice doing. Because I do actually think it can make an impact. If I constantly tell myself, “I am a confident person",then that’s bound to sink into my belief system, right? Similarly if I constantly self talk, “I am a loser. I can’t do anything right”, well… that sinks in too. 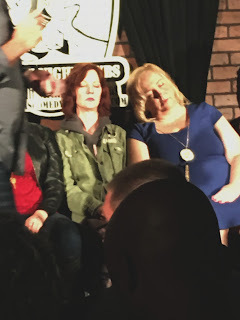 Anyway, I was curious how this “Stage Hypnosis” would go at the comedy club. So much so, that I really wanted to be one of the volunteers for the show. I had no idea if it would be individual hypnosis sessions, some group thing, or what. But soon after we got there, and the show started, I walk up to the stage as soon as the man asked for volunteers to come forward. All of the volunteers were asked to take a seat in one of the chairs lined up on the stage. The bright stage lights made it where I couldn’t see the audience, and I have to admit, I was a little concerned about if the group of friends I went with was video-ing me or taking photos, because of my fear of “looking stupid”. I didn’t look at the people sitting on either side of me. The man told us to focus on any area above his head and just listen to his voice, so that’s what I did. Looking at this picture makes me wonder if I was looking a little too high. Too high for my eyeballs to ever get a chance to relax. I'm in the army green jacket. Looking UP. He did a 7-ish minute relaxing meditation type of monologue for us. I am able to breathe and relax, so I did just that. Then he asked us to get deeper and deeper in our relaxed state. To picture ourselves in our most comfortable and safe place. (For me: bathtub) And then all of the sudden, I was very aware that whoever was next to me was totally crowding my space. Her arm was super mashed against mine. Then she started slumping into me. I tried to just ignore her weight and keep focusing and breathing. Summoning Calgon to take me away. The VERY beginning of me feeling crushed. Believe me, it got MUCH worse. But I continued to do whatever the guy asked us to do- not because I was hypnotized, but just because he was asking, and it wasn’t anything out of line. He asked us to pretend we were playing our favorite instrument, so I air-celloed. I felt slightly stupid, but I did it because I tend to be a rule-following-people-pleaser. Then he put on “rock music” and asked us to get really into it and pretend we were in the band. No. I just could not get into it. I couldn’t even decide which instrument I wanted to be pretending to play. But I could tell the girl next to me was the drummer. Beyond that, my eyes were shut so I didn’t know what other people were doing. (I’m not sure if my eyes were suppose to still be shut at this point, but I didn’t notice him ever saying to open them.) So I just sat in my chair for that part. As the music faded, and that part was over, I opened my eyes for a second, and the hypnotist man was looking at me. He looked away for a split second, but then looked back to me and said, “Ok, you can go back to your seat now.” Everyone else stayed on the stage for the duration of the show, except me. And for that, I am so thankful. They went on to do things that would have felt embarrassing to me. It’s weird to say this, since I am a musician and have performed on stages, but being on stage with all eyes on me is never something I’m comfortable with. But when I’m singing and playing my guitar, I know what I’m doing. And often, people aren’t really looking at me when I'm at a gig. They’re eating food, drinking wine, talking to their friends, and just glance at me and listen every now and then. But this was NOT that, and it felt very uncomfortable to me. Anyway, I have no idea how it was for the other participants. I don’t know if they were sober. I don’t know if they’re natural born performers. I don’t know if they’re introverted or extroverted, shy or outgoing. I don’t know if they felt like they were in a trance, or if like me, they were just following directions and doing what was asked. To me, it felt like an improv situation. During an “off” night for me. So I was never faking it. I was never claiming to be asleep just because I closed my eyes and proceeded to follow the man’s directions. But I was also the one asked to leave the stage. Clearly, I wasn’t an ideal participant. Was it because I wasn't a good candidate for hypnosis? Was it because he could see the weight of the person was screwing up my concentration? Whatever he read in my body language, he was right. Believe me when I say, I was happy to get off that stage. I watched the rest of the show, never really seeing it that these people were under hypnosis, in a trance state. Not at all. I just thought they were following directions, acting silly, and getting positive responses from the audience as they did it. It reminded me of when I was a kid and I so wanted to believe in magic. I ordered a magic kit and was sorely disappointed to get a box full of TRICKS rather than magic. What happened on that stage, didn’t feel like hypnosis to me. It felt relaxing, until it wasn’t. Then it was just uncomfortable. Maybe I would have a totally different experience had I not been on a stage in front of a lot of onlookers. With a girl napping on top of me. Having said all that, I did sleep better than night and actually remembered two of my dreams. And I got to see Mom in one of them. And honestly, that’s the best kind of magic I could have asked for. Hypnosis is for real. Once I attended a workshop on hypnotism. At the end of the workshop, the speaker hypnotised the attendees and I was really hypnotised, as it seems I was following his commands.